The NoNo Bracket is a specially engineered bracket that allows you to easily hang curtains and dramatically change the look of any room. The bracket attaches to your existing vertical blind head rail with ease. Attaches to outside mount vertical blinds. Fits up to a 1 inch curtain rod No Drilling No Hammering No Screws or Holes in the wall. Instructions - Important: Ensure your existing blind head rail is securely fastened to the wall. Do not install if head rail is lose or damaged. 1. Remove valance if present. 2. Slide the bracket over the vertical blind head rail. 3. Adjust the center screw as necessary to ensure a tight fit to the head rail. 4. Hang your curtains as normal. 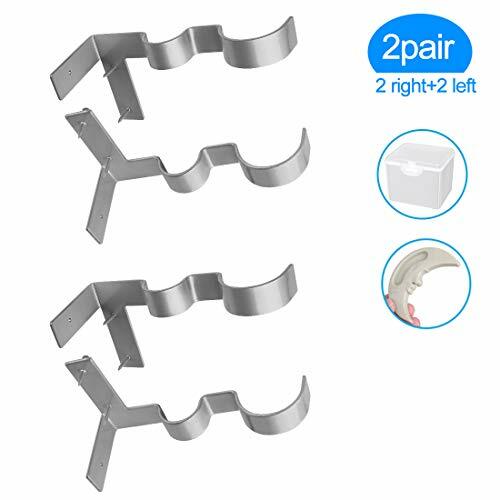 Double curtain rod brackets, 2sets(6pcs), no need for drilling, no nails, easy to operate, lift the curtain rods safely. [You will get] - 2sets (6pcs) curtain rod brackets + 1 window handle + 1 storage box. 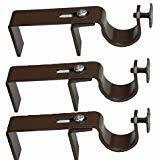 Includes 4pcs Curtain Rod Bracket + 2pcs Double Center Support Curtain Rod Bracket. [Top quality materials] - Our double curtain rod brackets are made of good quality metal for durability. The equipment weighs a total of 22 pounds. [Easy to install] - Just put it in the top corner of the window frame and tap it with a hammer. [100% satisfaction guarantee] - Yoaokiy brand products ensure quality, if you are not satisfied with any of the products, please contact us, we will deal with you immediately. 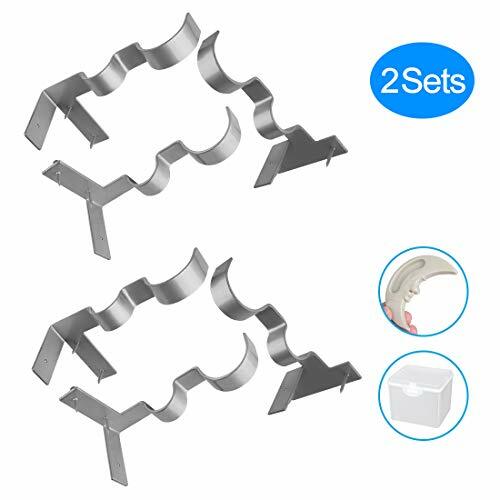 Double curtain rod brackets, 2sets (6pcs), no need for drilling, no nails, easy to operate, lift the curtain rods safely. --These are sturdy and hefty,ensuring quality and longevity. The Hang curtain rod holders are able to hold up to 20 lbs of weight without damaging your walls ! 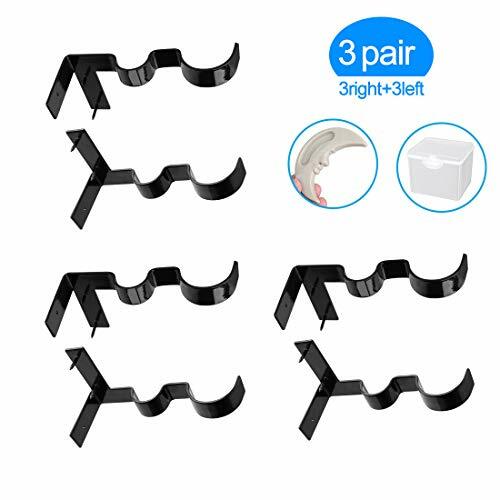 1.These unique easy to install curtain rod brackets install in literally seconds, as they just tap right into your window frame. 2.The way it works is, you simply place it on the top corners of your window frame and tap it in with a hammer. It'll make two tiny holes the size of a thumb-tack, and by using the leverage of a bar that goes alongside the edge of the frame, double curtain rod brackets safely hold the curtain bar up with ease. 3.With a contemporary style and a dark finish that stunningly complements anything that hangs from this double curtain rod holders ,you'll achieve a casual yet timeless look that effectively embellishes your home! SUITABLE GROUPS:Curtains,drapes,layering or extending over blinds. If you have any question of our double curtain rod holder,, please feel free to contact with us. Thank you! 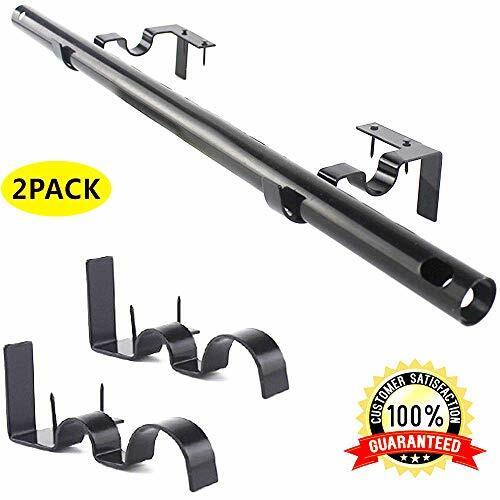 GREAT DECOR: These unique easy to install curtain rod brackets install in literally seconds, as they just tap right into your window frame. Our curtain rod holders require just a hammer or mallet as they require not drilling or nails, are easily removed with no damage left afterwards, and they come in single or double rod holders depending on your preference. EASY TO INSTALL: Simply tap the brackets into the top of your woodwork with a hammer without having to measure, level or drill holes in your walls or woodwork. It'll make two tiny holes the size of a thumb-tack, and by using the leverage of a bar that goes alongside the edge of the frame, it safely hold the curtain bar up with ease! FEATURE: These curtain rod holders work with any wooden window frame that's at least 1/2 inch wide from the wall, will fit any curtain rod up to 1 inch in diameter, and there's even an option for a center support bracket for extra long windows and curtains. 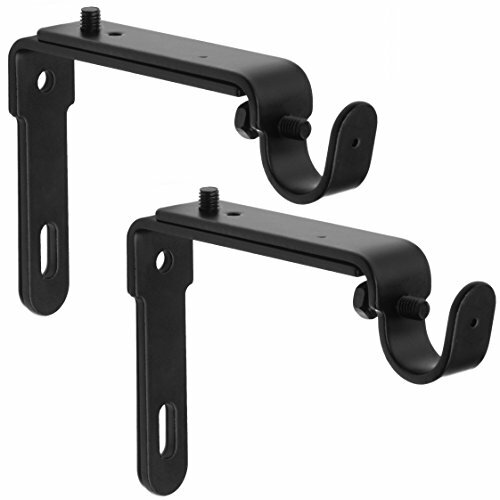 UQUINE ROD HOLDER: No Drill Double Curtain Rod, the double curtain rod brackets will hold one 1 inch and one 5/8 inch curtain rods, projecting 4 inches from the wall. MATERIAL: Each double curtain brackets double made of high quality metal, sturdy and durable. 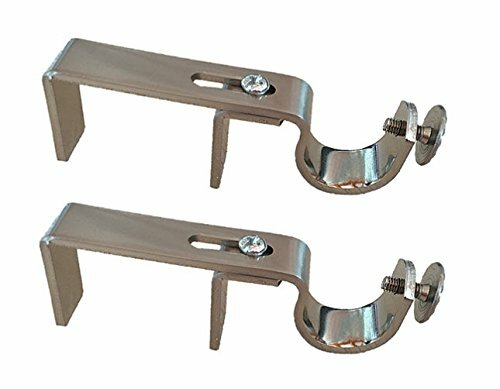 These unique easy to install curtain rod brackets are able to hold up to 20 lbs of weight without damaging your walls, and won't require you to level or adjust anything after installation as it'll always be as level as your window frame. Add A Touch of Elegance To Your Home! - Steel brackets can be used in new installations or as replacement brackets for existing rods. - With a contemporary style and a dark finish that stunningly complements anything that hangs from it, you'll achieve a casual yet timeless look that effectively embellishes your home. - Adept versatility offered by adjustable components serves effectively in a variety of different indoor scenarios. - Heavy duty, thick steel brackets weighing 2/5 of a pound can hold up the heaviest of drapes. - 4 matching screws and anchors provide everything you need to install a lasting and durable fixture for your walls and windows. - Designed by the brightest minds, utilizing only the highest quality materials and expert manufacturing methodologies, GrayBunny offers premium products for your home and garden while exceeding highest industry standards. Click the "Add to Cart" button on top to accessorize your indoor living space now! Supplies are limited! FUNCTIONAL: Two expandable steel brackets can be used in new installations or as replacement brackets for existing rods. Great for curtains, drapes, layering or extending over blinds. Matching screws included. 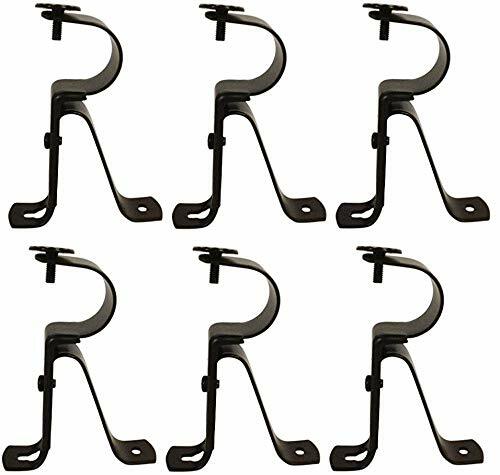 ADJUSTABLE: Bracket hooks adjust to accommodate a maximum rod diameter of 5/8 inches while the horizontal frame extends from 4 to 5 inches from the wall. These features offer adept versatility that serves effectively in a variety of different indoor scenarios. STYLISH: With a contemporary style and a dark finish that stunningly complements anything that hangs from it, you'll achieve a casual yet timeless look that effectively embellishes your home. PREMIUM QUALITY: Heavy duty, thick steel brackets weighing 2/5 of a pound remain secure while supporting heavy drapes. 4 matching screws and anchors provide everything you need to install a lasting and durable fixture for your walls and windows. GUARANTEE: GrayBunny offers premium products for your home and garden while exceeding highest industry standards and offering impeccable customer care. With a lifetime guarantee, if you'd like your money back at any time, just ask. Click the Add to cart button on the above right to adorn your indoor living space now! The NoNo Bracket is a specially engineered bracket that allows you to easily hang curtains and dramatically change the look of any room. The bracket attaches to your existing vertical blind head rail with ease. Attaches to outside mount vertical blinds. Fits 1 inch curtain rod No Drilling No Hammering No Screws or Holes in the wall. Instructions - Important: Ensure your existing blind head rail is securely fastened to the wall. Do not install if head rail is lose or damaged. 1. Remove valance if present. 2. Slide the bracket over the vertical blind head rail. 3. Adjust the center screw as necessary to ensure a tight fit to the head rail. 4. Hang your curtains as normal. 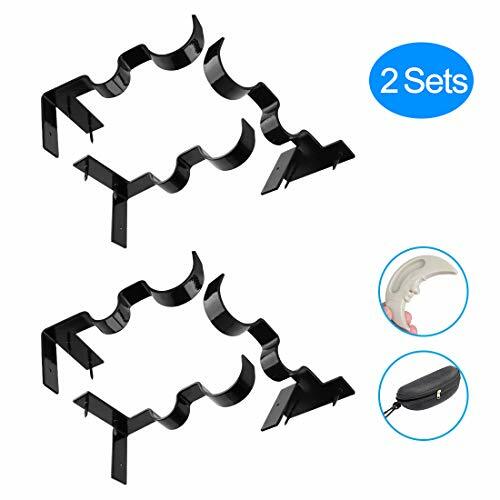 [You will get] - 2pair curtain rod brackets +1 window handle +1 storage box. 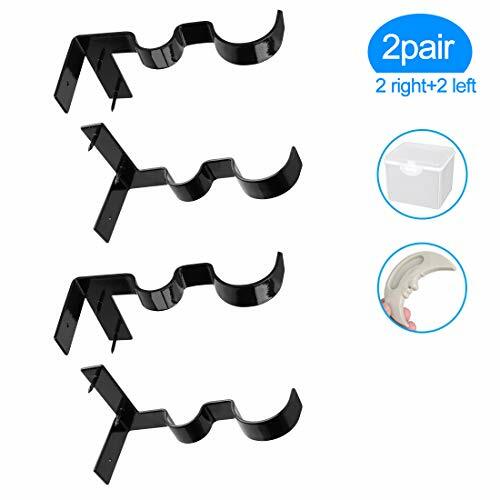 Double curtain rod brackets, 3pair (6pcs), black, no need for drilling, no nails, easy to operate, lift the curtain rods safely. [Package includes] - 3pair(6pcs) curtain rod holders + 1 window handle + 1 storage box. [Feature] - No screws and drills. Will not leave holes everywhere.